Launched in September 2018, the updated C-Class promises more flash, paired with added functionality. To top things off, there’s a BSVI-compliant diesel engine that not only makes more power than the outgoing unit but is also kinder to the environment. It looks like Mercedes has covered all bases then. Or has it? Among the first questions that will pop up when you see the C-Class in person will be ‘is this really the new car’? Even by facelift standards, the changes are subtle enough to go unnoticed by those not in the know. The dimensions remain unchanged and so does the basic shape and size of the headlamps and tail lamps. Our test car was the top-spec Progressive variant of the C 220 d, which packs full-LED headlamps. Dare we say, it looks better than the ‘Multibeam’ LED setup the more expensive C 300 d AMG Line gets. It also lends the C-Class an angrier-looking face, that’s complemented well by the reworked bumper. With the central airdam growing larger and faux air vents moving upwards, the front now appears visually wider. There’s no telling the updated C-Class apart from the old one from the side. Absolutely nothing new here save for the new set of 17-inch alloy wheels that are now standard. From the rear, the baby Mercedes apes not the S, but the mighty Maybach. The tail lamps get revised graphics, with a prominent C-shaped lighting pattern. And yes, if you’re wondering, it continues to get the chrome applique on the bumper that tries to imitate a set of exhausts. We’ve always liked how Mercedes-Benz has managed to mimic the S-Class in a smaller, tighter package. And even with the update, that feeling lingers on. If we could describe it in a word, we’d pick c-l-a-s-s-y! If you’re buying the C-Class thinking it’s a big, expensive car, it’s a Mercedes-Benz for God’s sake - it must have acres of space - then, you’d be mistaken. India doesn’t get the China-spec C-Class L (long wheelbase), so you have to make do with a cabin that isn’t particularly palatial. *Note - Front seat headroom measured for driver. For starters, you have to sit down inside the car. Those buying the car for their parents/grand parents, please take note. Once in, you see that the C-Class’ cabin is driver-centric. At the rear, there’s just about enough space for a six-footer to sit behind their own driving position. But, under-thigh support feels lacking, and the diving roofline gives rise to a shortage of headroom. Since Mercedes had to carve out the headliner to make space for the panoramic sunroof, the feeling of being close to the roof is amplified further. That said, anyone up to 5’10” should be comfortable here. But in case you’re taller, you’re forced to sit with your back at a sharper angle, which reduces kneeroom and under-thigh support further. In the front seat, there’s ample room for you to get comfortable and soak in all that the C-Class has to offer. This may be an ‘entry-level’ Mercedes, but there’s practically nothing in the cabin that makes it feel that way. There’s thoughtful use of materials, including faux wood on the dash and the centre console, robust-feeling switches for the power windows and the air-con, knurled knobs for controlling the airflow on the vents and an abundance of soft-touch materials everywhere. It doesn’t look like Mercedes-Benz has missed a spot - even the lower half of the doorpad is soft to touch! In terms of features, there’s nothing that’d make you go wow. But as they say, the devil is in the details. And that’s exactly why you pay what you pay for a luxury car such as the C-Class. Open the door and you notice the scuff plate lighting up in a smooth fade from dull to bright. Sit inside, click the seatbelt into place and the PreSafe tech tugs at it once to secure you in place. Something as seemingly minuscule as the reading lights that start-up and shut off with theatre dimming amplify the premium quotient further. The bulbs themselves are tucked away from view, under the inside rearview mirror. Thoughtful! Speaking of away from view, the 12V charge socket for the rear occupants are hidden from view. Press the panel under the rear air-con vents, and it’ll present itself. Slowly, in a damped manner, of course. You can also fiddle around with the seemingly unlimited options for ambient lighting. Open up the panoramic sunroof if you want the wind in your hair. Needless to say, the way all of these function feels so polished and rich. But the highlight in the facelift is the new 10.25-inch screen for the infotainment unit. It looks ages better than the screen it replaces, but it still isn’t a touchscreen. But fret not. Mercedes-Benz gives you a total of three ways to run through the menus - the touchpad, the dial and the buttons on the left-hand of the steering can all be used to do essentially the same thing. Pretty pointless if you ask us, but I guess we need to be glad you at least have a choice! The screen also supports Android Auto and Apple CarPlay (not in the Prime variant, sadly). But you’ll need a while before you get used to using these touch-based softwares using the touchpad or the dial. Sadly, the India-spec car doesn’t get the 12.3-inch TFT screen for the instrument cluster. Instead, you get good-old analogue dials with a colour screen stuffed in the middle. The screen isn’t lacking in terms of information, ease of use or even sharpness. But this omission, especially at this price point, seems unreasonable. The new steering wheel is the final piece of the puzzle. It sports two BlackBerry-like touch-sensitive buttons that let you scroll through menus on the two displays you have. Also, the cruise control buttons have now moved to the wheel itself, and aren’t on a separate stalk behind the wheel. That said, you need to really spend some time with the car to start using the steering-mounted buttons intuitively. Each switch does two things, and it takes time to remember which switch does what. Needless to mention, it has the usual luxury car bits too. There’s leather upholstery, electric seats for both the driver and co-driver (no memory seats, frustratingly), dual-zone climate control, cruise control with limiter and a banging 9-speaker 225W audio system. It also gets Mercedes’ ‘Attention Assist’ which monitors driver behaviour, picks up signs of fatigue and promptly advises the driver to take a break for a cuppa! Under the bonnet of the C-Class is a new 2.0-litre diesel engine. This is the same engine we’ve seen in the E-Class. But here, there’s a key difference, it’s BSVI-compliant. It makes the same 194PS of power and 400Nm of torque, and comes paired with a 9-speed automatic gearbox. Fire up the engine and the first feeling is that this new engine is noticeably quieter than the one it replaces. Get going, and this observation is only fortified further. Insulation has always been fantastic in the C-Class, and with the quieter engine, the experience is that much more enjoyable. Driving the C 220 d is quite engaging. There’s no dearth of power, and the shifts from the gearbox ensure you are in the correct gear most of the time. Drive calmly and the shifts are imperceptible. And should you want to overtake, a small flex of the right foot is all it takes. You don’t have to wait for the vehicle to react, it obeys commands almost instantly. That’s until you try to hurry the gearbox, that is. Here you will notice the gearbox hiccup and falter at times. On inclines, for instance, it feels hesitant to drop gears, and dowshifts only when the go power feels inadequate. Also, if you want to shimmy out of your lane and slam on the accelerator for that quick overtake on the highway, you’d notice the gearbox taking a split second before downshifting. Go all out, and the C-Class will hit 100kmph in 7.9 seconds. That’s a full second slower than the claimed 6.9-second time. The responsive gearbox makes its presence felt when you slam the pedal down in-gear. For instance, 20-80kmph takes just 5.02 seconds. Of course, both these times are in Sport+ mode, where the engine and gearbox are programmed to hold on to higher revs, even at idle. Other modes include Eco, Comfort, and Sport. There’s an Individual mode as well that lets you alter the behaviour of the engine, steering and ESP. You can set each to Eco, Comfort, and Sport. Using the preset Comfort and Eco modes will see the car become progressively lazier. We re-did the roll-on acceleration tests in the other modes and saw the 20-80kmph take 5.45 seconds in Comfort, and 5.81 seconds in Eco. The go-to mode for us has to be Comfort — it provides a nice balance between drivability and performance. This engine feels like it can munch miles for years together without batting an eyelid. And should you want to do that often, it’ll be happy to be kind to your wallet. Inside the city, the 2.0-litre engine returned a respectable 14.37kmpl, and climbed up to an impressive 21.40kmpl on the highway. It’s worth mentioning we were in Eco mode for the fuel runs. A fatter wallet makes up for the slightly dull throttle response. While the engine offers enough to excite in Sport+, it doesn’t feel overwhelming at any point. If an overwhelming amount of performance is what you’re after, we suggest you look at the C 300 d instead. 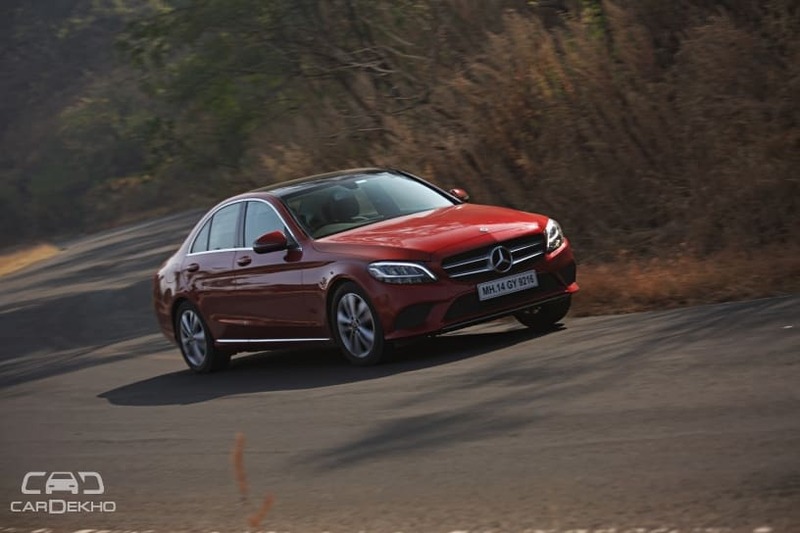 Unlike the global-spec versions, the India-spec C-Class doesn’t get adjustable damping. Good old fashioned springs are set up like they’d be in Stuttgart. It’s stiff, and often unforgiving if you go over a lot of bad roads in succession. You’d rock about side to side while tackling large craters at low speeds. But once you pass the bad patch, it’s like it never happened. The suspension regains composure so quickly that you begin to actually appreciate the setup. A softer setup would’ve induced a wallowy, bouncy feeling, especially at the rear. It would’ve also caused the car to bottom out over the really bad bits Indian roads are known for. So, yeah. We’ll take this stiff setup all day long. On the highway, this setup shines. It isn’t fazed by anything! But it makes sure it tells you what surface you’re driving on. For instance, driving over concrete and paver blocks feel different from behind the wheel. You notice the suspension working (quietly) in the background. You can take the C-Class corner carving too. The chassis feels ever ready to be dunked hard into bends. But it’s let down by a somewhat vague steering. Small inputs to the wheel don’t translate proportionally to the wheels. Dial in some more turn and it tends to turn in more than you’d want it to. So there’s a bit of a learning curve here if you want to blitz through the ghats. That said, you can carry a lot of speed into the bend. And that’s because you can be dead sure that the brakes have your back. Stopping performance is unreal as the C-Class comes to a halt from 100-0kmph in just 35.60 metres and just 2.5 seconds. Careful though. Going too hard on the brakes will see fade set in quickly, and you’ll smell the pads cooking too. Irrespective of the variant you pick, you get a host of safety tech. There are seven airbags (dual front, side, curtain, and driver’s knee), anti-lock brakes with EBD as well as ISOFIX child seat mounts. The C-Class also features an Active Bonnet that raises the bonnet from the rear hinges (with the use of pyrotechnics) to ensure it minimizes impact and risk of injury for a pedestrian. There’s parking assist as well that helps hunts for parking spots and also steers and accelerates to make parking that much easier. With the update, the C-Class isn’t a biblically different car than before. It continues to look and feel posh, is built like a tank and has snob value like nothing else in the segment. The refinement of the new engine brings with it an added air of premiumness. Yes, we’d have liked some more features (say a 360° camera, ventilated seats, electric steering-column adjust) at this price point. But, other than that and slightly stingy room at the rear, we can’t really pick bones. It’s the good old C-Class recipe, just fine-tuned and perfected over time.